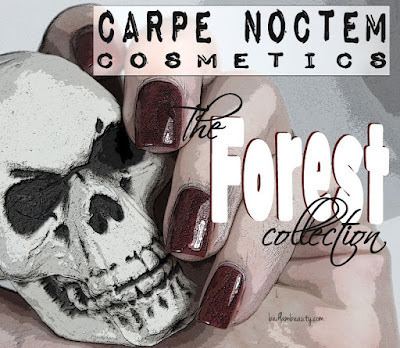 It wouldn't be Halloween without a little something from Carpe Noctem Cosmetics, and you know that Ms Emily would never disappoint us. This season the theme is Forest...and it is beautiful. 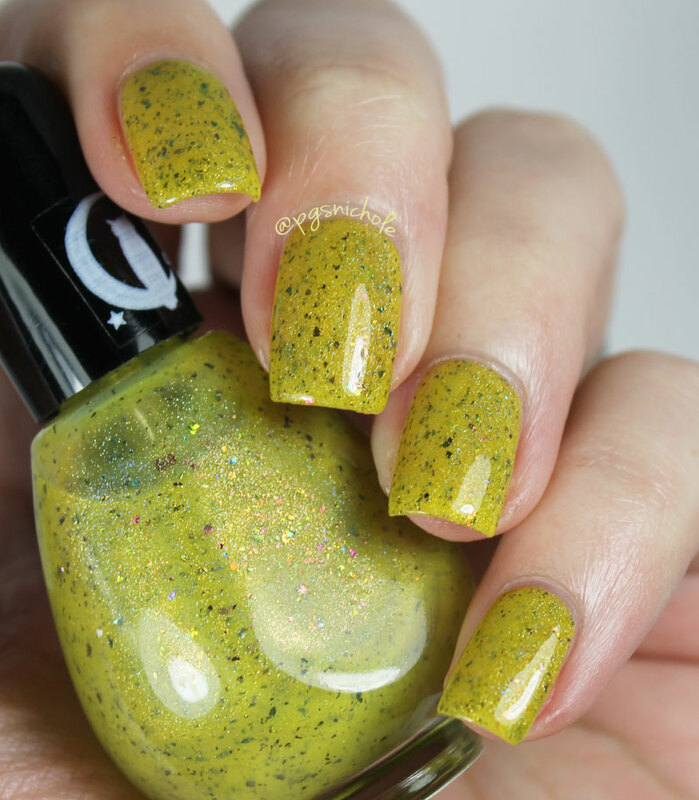 This is a metallic soft emerald green holo with a gentle dusting of cool green flakes. On my cool toned skin it has a decidedly warm caste, and I love it. This could be a definite season-spanner. 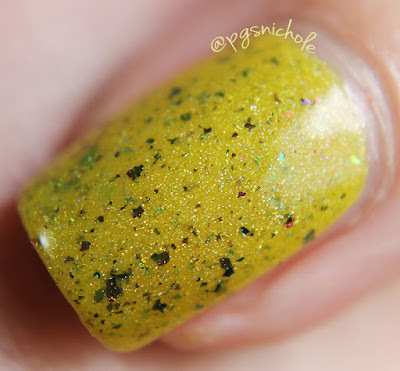 The formula is the typical CNC perfection and I used two coats + Seche Vite for the pictures below. This one is possibly the most perfect yellow-green ever. It is exactly the color of fresh growth on evergreens, and it makes me feel like spring is looming. It is a delectable jelly formula and is filled with delicate scattered holo and multichrome flakes. I only needed two coats + SV for the pictures below. Oh my. I have a thing for luminous white shades like this. They are so hard to find and find a good one. This is a pale, pearly white/blue creamy-jelly holo dusted with pale gold flakes. It reminds me of the Moon on a cold Fall night. I imagine if we had snow around here, it would probably be reminiscent of that too...I used two average coats + SV and I was ready to rock. 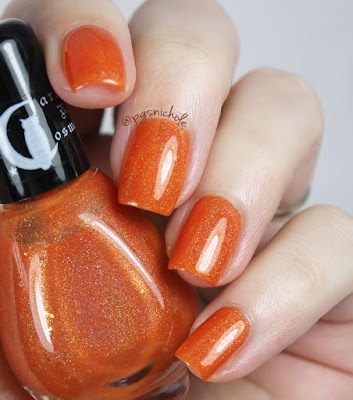 This is a medium orange jelly holo with iridescent flakes peeking out here and there. 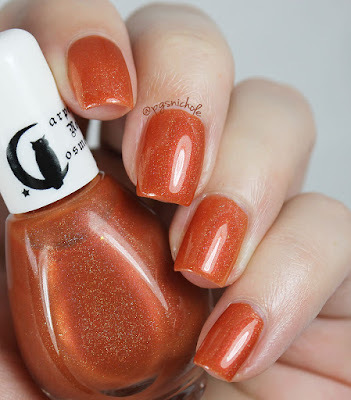 This is probably the best "pumpkin orange" non creme polish I have come across. It has a subtle pink flash which gives it that luminosity that usually only natural things have. I used two coats + SV for the pictures below. For those who don't know how crazy I am, lemme just tell you a secret: I take notes while I swatch. I jot down things about the finish, smell, color, etc...and for this shade I have more than five different color descriptors. This is a red-orange/bright rust/hot tamale red shade...but looking at it now, I think it reminds me of cinnabar. Tl;dr it is an unusual-but-seasonally-appropriate Fall shade. It has a strong holo as well as gold flakes. I used two coats + SV, and it glowed like crazy. 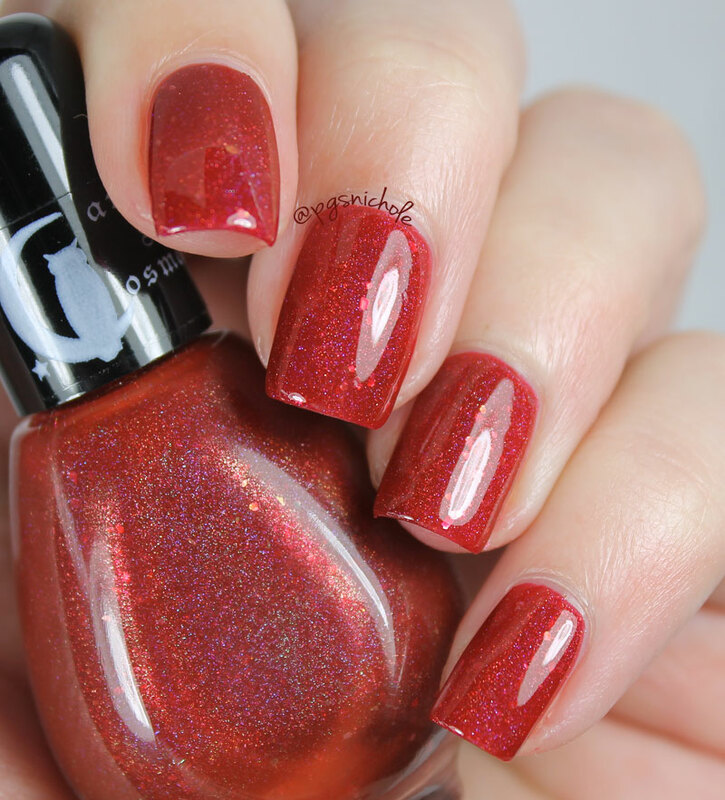 I don't think this polish can be judged by pictures...you'd better just buy it so you can see for yourself. This whole collection is just amazing. I don't know how Emily manages to think up new and amazing shades over and over again. I think, if I had to pick just two...I'd pick Faerie Synthesis and Burning Bushes. But that is only if I were forced at knife-point. I think those two would stand out in any proper hoarders collection and be a good intro to the CNC brand if you haven't tried these yet. Which one is your favorite? Snowfall Serenity and Burning Bushes are my favorites of the bunch. BB is so perfectly fall. Canyon Copper and Burning Bushes just might make me finally make my first CNC purchase! :) That orange!!!! Burning Bushes would be amazing with your coloring. Ooh they're all gorgeous but I really love Canyon Copper! I think mine too...but I can't be sure. I can't believe I don't own any polishes from this brand yet. The yellow-green and soft gray are my personal favorites. let that yellow-green be your first. It is such a crazy-unique shade, and the application is to-die-for. 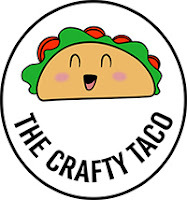 I need to try this brand. Those oranges and the red slay me. the red would look gorgeous on you. Beautiful collection. Another indie you have turned me to and I have no regrets with them so far. Definitely need to grab that yellow-green one. shes got a more citron yellow coming too. And yay! I'm glad CNC is on your radar now. That mustard intrigues me. I'm completely drawn in. isnt it the most unlikely favorite? I'm rethinking all of my polish-related values now. That green! Ahhhhhh I just love holos with flakies. This whole collection is so my jam. Fantastic swatches. Such a great collection! I Come From the Forest is gorgeous, and so is Canyon Copper... and Burning Bushes. Who am I kidding? I love them all!!! Canyon Copper and Burning Bushes are beautiful! I also like I Come From the Forest...ok, maybe I love it. 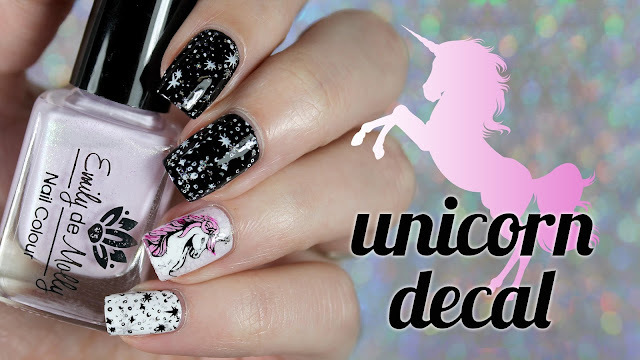 as always, coveting your nails. I Come From the Forest is amazing!! !